Then I saw a autoupdateurl on d2gs reg file, for what is this for? This file: D2XP_IX86_1xx_112A.mpq will be downloaded? And how it works? This will be the Patch_D2.mpq? Edit: Got the mpq from http://pvpgn.harpywar.com/mpq/ and Added all the files that I've changed in Patch_D2.mpq.. But.. if I update the features on that MPQ again, how it will verify? Made some tests, no success. Jul 27 05:41:44 [info ] conn_set_archtag:  setting client arch to "IX86"
Jul 27 05:41:44 [info ] conn_set_clienttag:  setting client type to "D2XP"
Jul 27 05:41:44 [info ] conn_set_gamelang:  setting client gamelang to "enUS"
Jul 27 05:41:44 [info ] _client_authreq109:  client matches versiontag "D2XP_113C"
Client send version of exe file when connecting to a server (Game.exe for Diablo 2, StarCraft.exe for Starcraft, War3.exe for Warcraft 3). These versions are checked by the server in versioncheck.conf, which versiontag are corresponding to autoupdate.conf. Your versioncheck entry with 51440 is incorrect (I think you made these changes for testing). 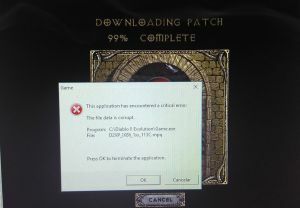 May be checking is implemented only by checksum in PvPGN, and as you can see from the logs, checksum of your Game.exe is correct (0x7686beca), so server decide that you already have version 1.13c and skip autoupdate. Also I'm not sure that you can modify content of update mpq files, cause mpq may be signed by Blizzard. But I might be wrong and you can try it. 1xx means full patch that can be applied to any game version. This is done to save bandwidth. If you have not intermediate version patches you should disable(comment) them in autoupdate.conf, and full mpq patch will be used. But the problem is Blizzard removed most of the old update files and there are only the latest versions (you can't download D2XP_IX86_1xx_113c.mpq from there anymore). 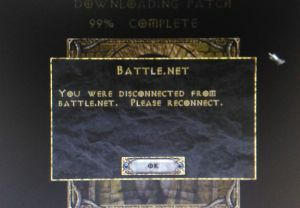 Files in http://pvpgn.harpywar.com/mpq/ are all that I've found in the internet or download from Battle.net. Let me know if you found missing files anywhere. What about autoupdateurl in d2gs.reg - I don't know this purpose. I also saw it before but didn't test it. I could not find any documentation about this feature. May be this is a way to autoupdate Patch_D2.mpq. And it would be great if you could explore it from all sides to try make it working. Hmm, my thoughts was that versionchek get the info then "set" the name D2XP_113C and then it passes through autoupdate and there if exists that name in the third column would upload it, but doesn't seem to work in this way. Jul 27 09:48:53 [info ] conn_set_archtag:  setting client arch to "IX86"
Jul 27 09:48:53 [info ] conn_set_clienttag:  setting client type to "D2XP"
Jul 27 09:48:53 [info ] conn_set_gamelang:  setting client gamelang to "enUS"
It closed the connection, so when the autoupdate works? Just to test out, I've added all the files that I modifiend inside that D2XP_IX86_1xx_113c.mpq (and inside it really has the same files, I had to overwrite then), maybe makes some sense. Jul 27 14:15:18 [info ] conn_set_archtag:  setting client arch to "IX86"
Jul 27 14:15:18 [info ] conn_set_clienttag:  setting client type to "D2XP"
Jul 27 14:15:18 [info ] conn_set_gamelang:  setting client gamelang to "esES"
Jul 27 14:15:19 [info ] _client_authreq109:  client matches versiontag "D2XP_113C"
Game.exe wrong, ok, want to run autoupdate here too. Jul 27 19:31:40 [info ] conn_set_archtag:  setting client arch to "IX86"
Jul 27 19:31:40 [info ] conn_set_clienttag:  setting client type to "D2XP"
Jul 27 19:31:40 [info ] conn_set_gamelang:  setting client gamelang to "enUS"
Jul 27 19:31:41 [info ] _client_authreq109:  client matches versiontag "D2XP_112A"
I don't know if this one could create game, but it shouldn't have closed? I don't want this version on my servers, I need to completely remove this entries from versioncheck? In the example clients will request update for all defined versions (but not D2XP_113C because it's not set in autoupdate.conf). Don't know how to make this autoupdate works.. I've tried to remove all other versions from versioncheck too, but it still validating wrong versions..
And yeah, maybe you are right, I've tried with my modified mpq and said it's corrupted.